The methods presented in this factsheet are used to make water drinkable. They can be applied at hole, at the family level. Treating drinking water prior to consumption combats many illnesses such as dysentery, typhoid fever and cholera. 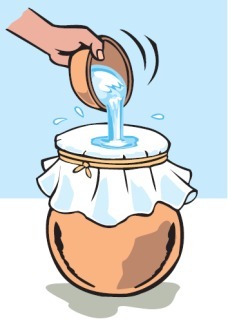 It is easy to filter water using cloth. This kind of filtration will eliminate the main solid impurities from water as well as any insect larvae that it may contain. The cloth used, cotton preferably, must be thick enough to properly retain the impurities. If it is too thick, then filtration will take longer. It must always be washed prior to use. Straining alone is not a sufficient form of treatment. 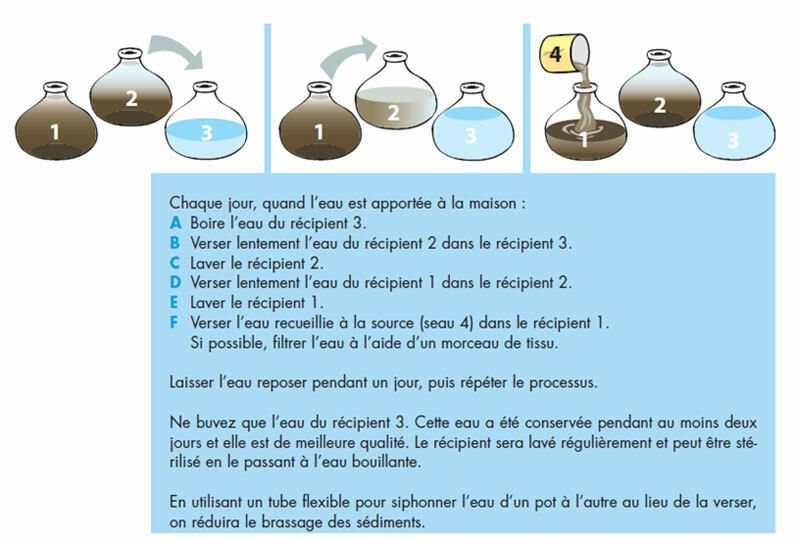 Nevertheless, straining water before treating it using one of the other methods described in this factsheet will significantly improve the quality of the water obtained. This method serves the same purpose as filtration by removing the main solid impurities found in water. For improved efficiency, this method may be used to complement filtration. - Easy to use. Almost no cost. Boiling too is relatively easy to do. It will kill all of the germs and micro-organisms present in the water. To do so, first filter or decant the water, then bring it to a rolling, bubbling boil (simply steaming water is not boiled) for one minute at low altitude and for at least three minutes at altitudes above 2,000 metres. Boiled water may lack taste. 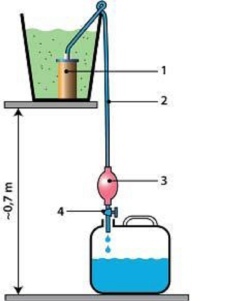 This problem can be solved by vigorously shaking the water to re-oxygenise it or by adding a little salt. Chlorination is a simple and effective way to disinfect water to make it drinkable. It comprises introducing chlorinated products (chlorine tabs, bleach, etc.) into the water to kill the micro-organisms contained in it. After the products have acted for 30 minutes, the water will be drinkable. It remains so for a few days (depending on storage conditions) thanks to the non volatility of the chlorine. - Muddy water can be made drinkable. If the treatment is done properly, all of the pathogens are eliminated. - Chlorination has a durable effect. - Products must, for the most part, be brought in from elsewhere. Handling risks involved. 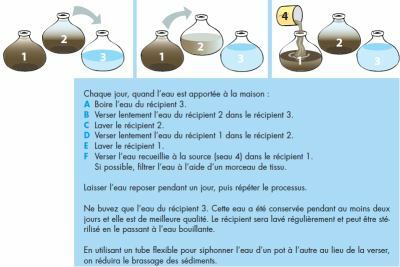 Chlorination may, for example, take place after flocculation, where necessary in an earthenware pot fitted with a tap on the bottom (The drinking water station dreamt up by Dr Monjour, see end) or in any other recipient. (For more information, refer to Factsheet E21 “Treatment by Slow Sand Filtration”). - Easy to use. Low cost. - Suited to emergency situations. - Allows only summary water treatment. - Is only effective in providing pre-treatment for solar, chlorination or boiling disinfection methods. This filter offers a way to both filter and decontaminate. - When properly maintained, a biological sand filter is effective for a long time. Low cost. - Treatment may take time. - More complex maintenance and follow up required. (For more information, refer to Factsheet E22 “Treatment by Ceramic Filters”). Ceramic filters have been used to treat water for many centuries. Depending on their type, small fixed (individual) installations or transportable devices are used to filter water wherever needed. This equipments can be supplied by makers of water purification systems and products. In developing countries, these filters are made locally, often by self financing micro-enterprises. They often take the shape of a flower pot or a bowl and are impregnated with fine silver colloidal particles serving as a disinfectant, stopping bacteria proliferation in the filter. The filter is installed in a 20 to 30 litre container, whether plastic or ceramic. These mechanisms when properly designed and well made may eliminate or disable almost all protozoan bacteria and parasites. On the other hand, they are ineffective against viruses. Filter cleaning and maintenance is very important : we recommend implementing an educational programme covering clean storage techniques, filter cleaning and other recommended actions. - Fairly low cost when the filter is made locally. - Low production rate (one to two litres per hour). - Potential recontamination hazard for water stored without residual chlorination. - Requires filter maintenance (using a cleaning brush). (For more information, refer to Factsheet E19 “Treatment by Sun Exposure. SODIS and Solvatten Methods”). 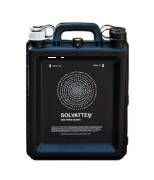 The SODIS method is perfect for treating drinking water in developing countries as it requires only sunlight and lightweight transparent plastic bottles made from PET (polyethylene terephtalate). Clear PET bottles are filled with water and exposed to sunlight for six hours. The UV A radiation in the sunlight kills infectious germs like viruses, bacteria and parasites (Giardia and Cryptosporidia). The method also works at low air and water temperatures. The Solvatten method was perfected by the Swedish body of the same name. It is a clever adaptation of the SODIS method. It uses a special container filled with water (after first filtering or decanting, when very murky), and that is exposed to sunlight. After two to six hours, depending on weather conditions, a red spot on the device turns green, showing that treatment is finished. The water can then be left to cool for drinking, or used hot, for cooking food. The Solvatten method combines filtration and UV disinfection as well as heating. This fairly recent and especially simple method was invented by a Dane, Vestergaard Frandsen, who sells the process through a Swiss company of the same name with 11 continental or regional entities. It comprises sucking water through a straw, not a real one, but rather a small plastic tube 3 cm in diameter and 25 cm long containing disinfectant filters, especially active charcoal and iodine product based (the latter now to be reduced, given the taste it sometimes gives to water). This device, which costs some €3 (in quantity, sometimes more) should be able to filter 700 to 1,000 litres of water. 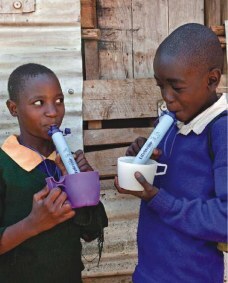 The company which specialises in products for emergency situations or for preventing certain illnesses has also perfected the so-called “Lifestraw Family” a device to extend the principle to use by a whole family and able to filter 15,000 to 18,000 litres of water. - A product better suited to emergency or temporary situations. comparison with the average cost of simple and definitive drinking water piping (€20 to 30 per person). (For more information, refer to Factsheet E20 “Treatment Using Solar Power and Production of UV Radations). The latter method was perfected by Dutch company NEDAP who have developed a small size mobile device weighing 75 Kg called “Naiade”. The process disinfects water using a UV light after first filtering it. The light is supplied with power from a solar panel. 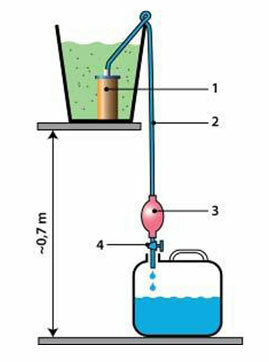 After filling the tank, the water passes through three filters that successively retain gravel, suspended matter and particles. The UV heats up in two minutes and gives off UV radiation that disinfects the water at a rate of 4 to 5 litres per minute. It can purify up to 2,500 litres of water in ten hours. The ex-factory price of a Naiade unit is at least 4,000 Euros. Over a ten year service life, in a village with a population of 250, this represents an investment of two Euro cents per day for 20 litres of water per head of population. This price includes writing off the equipment, running and maintenance costs. However its cost once installed on-site may hit €6,000. - Costs little to maintain once the equipment has been purchased. - Offers a good daily production capacity (up to 2,500 litres of drinking water). - Imported equipment. High purchase price (at least €4,000). - Water is not protected against contamination when not used quickly enough. This concept was born in 2004 in Cambodia, developed by a French NGO called 1001 fontaines (fountains). It aims to supply drinking water to people or villages lacking it, while creating a small local business in selling the water produced at a low price, but one sufficient to pay the people tasked with operating and expanding it. The technique used is practically the same as the previous one. 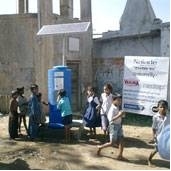 The device itself called “Fontaine”, which takes up little space, comprises four filters and a UV light supplied with power from a solar panel. Before the water enters the filters, for safety’s sake, it is cleared of its suspended matter by decanting it in two large adjacent tanks. Then the water successively flows through four ever finer filters, before it is exposed to UV light radiation, killing or inhibiting the bacteria.